If you're planning a party, let the professionals lend a hand. We offer a wide variety of delicious options that not only will cut your work load but also will impress your guests. .
contain an assortment of cheeses beautifully displayed to serve. Also works well as an accompaniment to platters of shaved meats and dinner rolls for sandwiches. are arrangements of summer sausage, smoked ham and hard salami with a variety of cheeses. 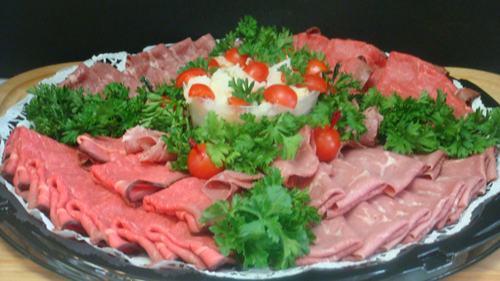 Is a beautiful tray made with turkey breast, roast beef, pastrami and smoked ham, plus a variety of cheeses.